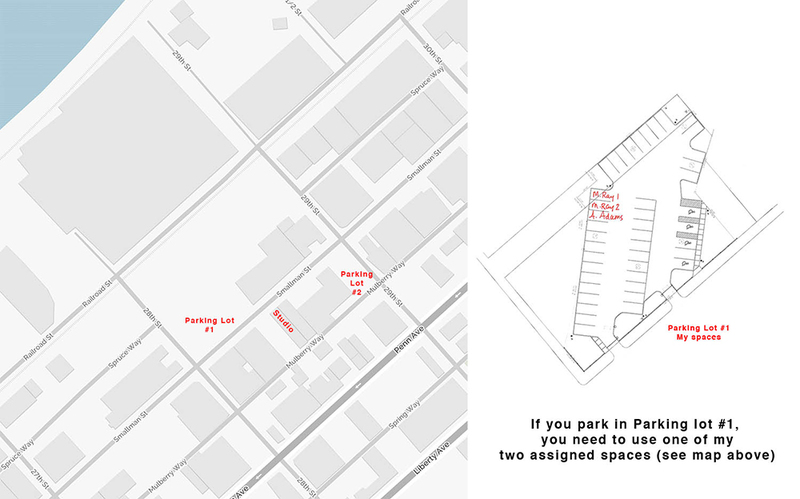 Here is a map to a few free parking spaces that you can use when you come for your headshot. I rent spaces in two lots near my studio. I have two spaces in the “Club House” parking lot across the street from my Smallman Street studio. Right after you cross the 28th Street stop sign on Smallman (coming from downtown) you will turn left into the parking lot. Please keep in mind that I have two specific spaces available for you to park in. Please use the map to see which spaces are mine to use. There are small signs for all the parking spaces along the outside fence and my two spaces are near the back/left of the parking lot. The other lot that you can use is a small gravel lot on 29th street. When heading out of downtown, you will make a right onto 29th Street and then a right into the lot at the end of the corner building. The lot is small and houses only five or six cars. If you can, please park to the far left of the lot.